Shabda'rtha~The Sound and The Meaning is North Texas' vibrant kirtan and world music ensemble. The band has a unique and diverse sound, which allows them to perform for a wide variety of events, from kirtan concerts to yoga classes, satsang or meditation classes, festivals and parties. Kirtan, or bhakti yoga, is food for the divine self and a beautiful way to join with others as one heart in unity and joy. Their approach to kirtan is non-traditional and very accessible, combining many instruments, forms, and styles, and chanting and singing in both English and Sanskrit. As all members are practicing yogis, they flow interactively with the energy and pulse of yoga classes large and small, indoors or out. 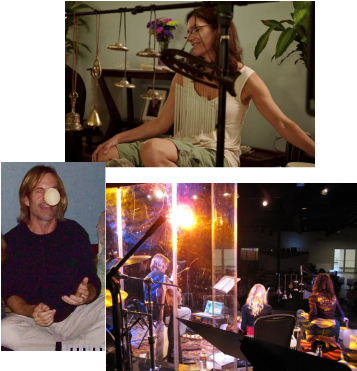 The band was founded by longtime music producer, sound designer, composer and sound mixer David Rosenblad (DRM:sir reel sound) on guitar, electric sitar, keyboards and vocals, with co-leader Rica Potenz on percussion and keyboards, members include Grant Goble and Riley Pennell on bass, Shanti Michelle on guitar and vocals, drums and keyboards, Tony Alcorn and Gypsy Romani on percussion, Gabriella Ozi on vocals…guest performers have included Mahadeva Jaya, Kristin & Randall Brooks, Sam Hobbs, Sourav Biswas, Bryce Delbridge, Sadhu Nada, Maggie Metzinger, Leila Cranford, Lizzie Davis, Mark Williams, Julie Harris, and Rebecca Jones. Kirtan is FOOD for your Divine Self!